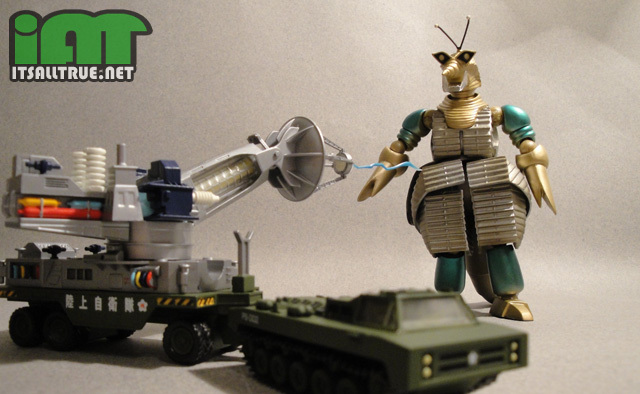 Taking a break from the giant monsters this time out, Revoltech has released the Type 66 Maser Cannon as its fifteenth “figure” in the Sci-Fi line. Godzilla fans will recognize this classic laser shooting satellite dish as one of Japan’s weapons against the monsters, but how does it stack up against this line? 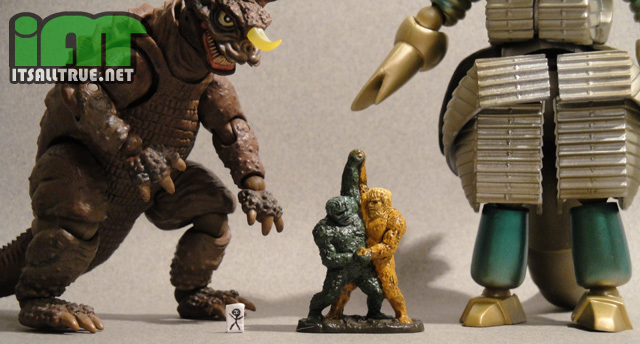 The Type 66 Maser Cannon first appeared in the 1966 movie War of the Gargantuas. 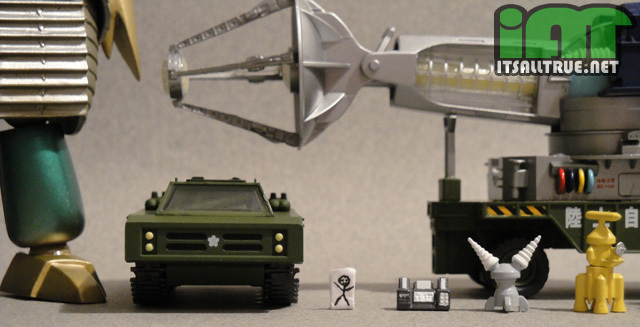 Appearing in three more movies and spawning two modern updates, the Maser Cannon is one of the most recognizable weapons used to defend against Godzilla and his ilk. The Maser is able to focus plasma energy into jagged beams which could hurt most of the kaiju that attacked Japan. The only downside is that the reactor core is highly fragile and can’t handle high temperatures. So usually any energy beams emitted by the monsters in defense would destroy the tanks. To be honest, I wasn’t entirely sure I was going to buy this toy. I was into this line to buy the monsters. Getting a highly articulated figure for $30 is one thing, but buying a vehicle for that same price really put me to the test. To make things worse, the Maser looked too big to me. With its large size, I didn’t think it would fit in with the monsters that had already been released. So far the scale discrepancy hasn’t bothered me too much amongst the kaiju, but what’s the point of having a vehicle that wouldn’t fit in? I was convinced any display would look terrible. So why did I end up ordering this? I’m not really sure. I guess I decided to take a chance and hope for the best. So, when the Maser arrived last week, I tried to keep an open mind while opening it. The first thing that struck me is how well detailed this vehicle is. (I should actually say vehicles because there is the treaded tank and the trailer it pulls, which is where the Maser sits. They are two pieces that are joined together by a double revolver joint and can be separated easily.) If you read my reviews you know I love tiny details, and the Maser is packed with them. Everywhere you look on the cannon you can see intricately sculpted tiny coils, tubes, and vents. The cannon’s arm is translucent in the middle with a milky looking yellow cylinder surrounded by raised bars. Behind the head of the dish is a tangle of cords with tiny sculpted segments. While the dish itself is smooth, the array that sticks out front has intricately sculpted hydraulics and beams, leading to the translucent lens with tiny hatch marks on the inside. Also, the wheels are rubber and that’s just awesome. The tank is much plainer than the Maser, but still accurately detailed. The lights, vents, and treads are all sculpted pieces. There are even two seats in the cockpit. At first I thought this was just another nice detail, but it led me to an idea that helped put my mind at ease. Looking at these tiny seats, I got to thinking about the size of the person that could fit in the tank compared to the size of the monsters and other accessories. I decided to make a little paper man for my kaiju universe to see how everything matched up. When compared to the Tokyo Tower that came with Mothra or the cabin that came with Baragon, my little man doesn’t fit in too well. But if you just put him with the monsters, the Maser and Markalite Cannons, and the computer console; then he fits in nicely. This made me feel so much better about displaying all of them together. The Maser Cannon isn’t as super articulated as a normal figure, but it still has some to offer. The wheels all move. The main cylinder of the Cannon is on a swivel joint and can spin 360 degrees. The base of the arm and the satellite dish head are both hinge joints, allowing the Maser to have wide range to aim with. There is also a double Revolver joint connecting the tank to the Maser, which allows for a pretty realistic looking turning radius. One thing I was disappointed with is the tank vehicle’s treads are sculpted and don’t move. It doesn’t even have wheels, so when you’re pulling the Maser along the tank’s just scraping the ground. The Maser also comes with some great accessories. There are the two Gargantuas from its debut movie. They are molded in place, which is too bad. But they do have some nice detailing to their furry bodies. You also get the computer console, the yellow Trip Wire Cannon, and an electrode. Each is nicely detailed and very small, but still in scale with my paper man, which is a bonus. There is also an alternate firing lens for the Maser, a nameplate, and the notorious orange box. 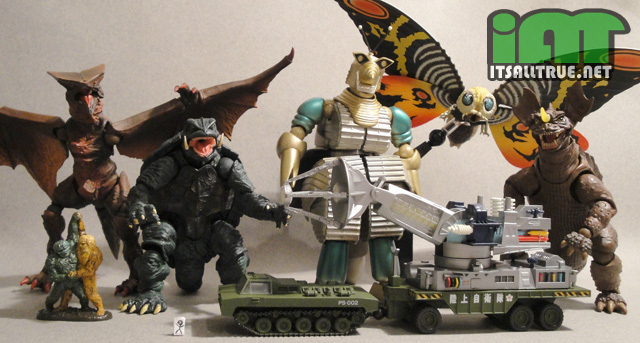 I ended up being very pleased with the Maser Cannon, especially when I discovered the scale wasn’t entirely ruined, and I’m actually really happy to have it as part of my kaiju collection. Like the rest of the Revoltechs, the Maser will set you back about $30. This may be too much for a vehicle with limited articulation, but if you’re collecting these Toho figures you might not want to pass this one up. I love out of the box thinking when it comes to toys. This could make me buy some of the monsters just so I had a reason to own it! lol, I have to admit it’s pretty cool. I had my doubts at first, but once I had it in hand it won me over. Thanks, that Kup looks great. are those 2 little monster dudes dancing with each other? It looks like their dancing, but they’re supposed to be fighting.